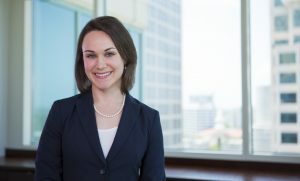 Jessica Shapiro is a transactional real estate attorney in Gunster’s West Palm Beach, Florida office. Jessica assists lenders, borrowers, developers, buyers and sellers with all aspects of commercial and residential real estate transactions. She also represents home builders in the acquisition, development and financing of land and the creation of developments governed by condominium and homeowners’ association regimes. Jessica began her career as an attorney for the U.S. Department of Housing and Urban Development, where she worked with lenders and borrowers of federally insured loans for apartment complexes, nursing homes and assisted living facilities. Prior to joining Gunster, she worked for national and global law firms, where she represented corporate clients in a variety of financing transactions for real estate and commercial aircraft. Jessica earned her B.A. degree in Architecture from Yale University and J.D. from the University of Florida, Levin College of Law.